Now the dress is completed. The total time taken was 5 hours but this could have been reduced in several ways, not least by taking a few minutes to read the layout instructions at the very beginning of the project! 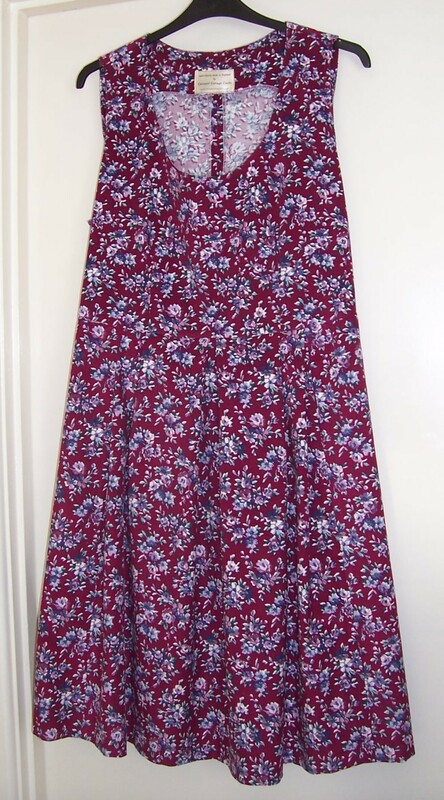 Comments on construction: The instructions include binding the back sections of the skirt with bias but as it is not seen, it could easily be hemmed in the usual way thus saving four rows of stitching. 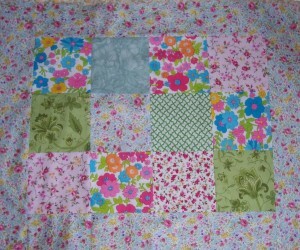 I did not use a binding foot which meant that each piece of binding had to be stitched twice. The hem on the circular part of the skirt is double folded and involves two rows of stitching. It could more easily and much more quickly be neatened with the overlocker and then machined in place. Bearing in mind that a lot of the bodice edges were on the bias I took great care to ensure that I did not stretch it out of shape when applying the binding. 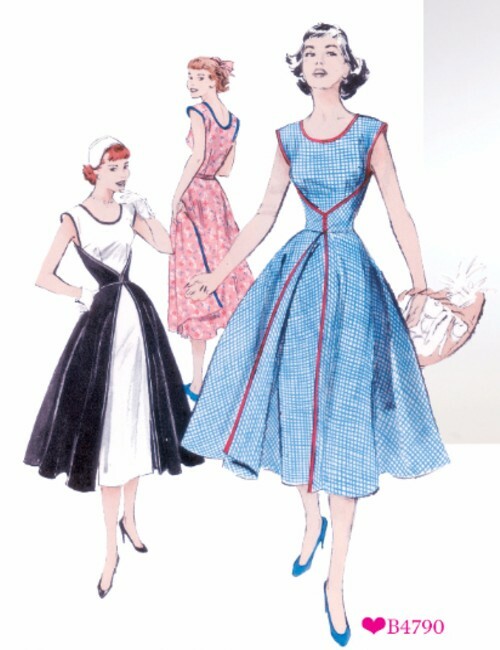 I notice that the back neckline scoop is lower than the front and also because of the weight of all that circular skirt there is a tendency for the dress to pull to the back thereby making the back neckline even lower. The pattern envelope suggests 3 packs of bias binding but I did not use anywhere near as much as this so now have a small stash of black bias binding. 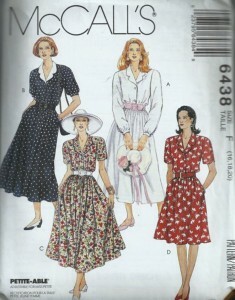 Perhaps I will use it together with the half yard of fabric that is also left over from cutting out the pattern. Comments on fit: I used to have an “Hourglass” figure but I’m afraid the time has run out and I am now more of an “Apple” shape. This being so means that I have had to make an adjustment/”work around” to ensure that I can fasten the dress back and front. To do this I made an extension piece on the front (which comes from the back) left-hand side on which to stitch the buttons for the three button loops. I balanced up the button loops with a matching set of faux loops and buttons. As I could not find just the right buttons, I have used 22mm self-covered buttons which I think are perfect! On the back (which is an extension of the front) I added two extension pieces to take the button and buttonhole fastening. As I no longer have an hourglass figure it would help the fit of the front if the second body dart was reduced or omitted. As usual, my bust point is 1” lower than the pattern so the bust dart and body dart points need to be moved accordingly. 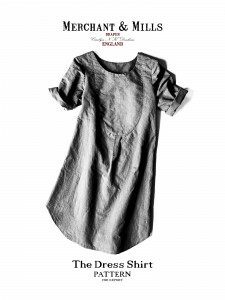 The armholes gaped at the front and necessitate a dart to reduce the armhole shaping. To counteract the tendency for the back bodice to be pulled down by the weight of the circular skirt, next time I would raise that neckline slightly. Final analysis: Having made up the pattern once any further constructions should be more time efficient and could reasonably be made in 4 hours. I enjoy the “uniqueness” of the dress (especially the liquorice allsorts print!) 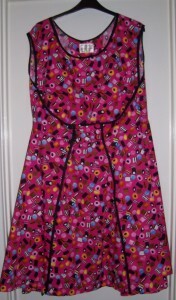 and will probably make another in a combination of fabrics, e.g. 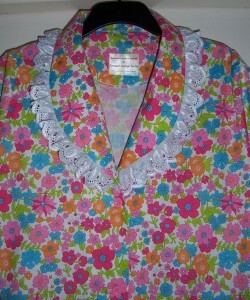 positive/negative print such as dots or two-tone floral print. The Spring Floral print blouse was the test run for this lovely White Polyester Crepe blouse with lace overlay on the collar and sleeve bands. The White Crepe fabric was from a bolt that I purchased several years ago, which now with having used another 2 metres for this blouse, is down to the last metre and a half that I shall probably use for a short length divided petticoat. 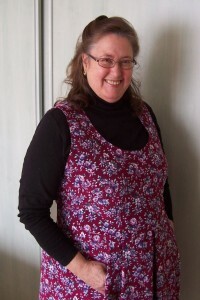 Using the hack from McCalls 6438, the blouse was inspired by the photograph on a knitting pattern. 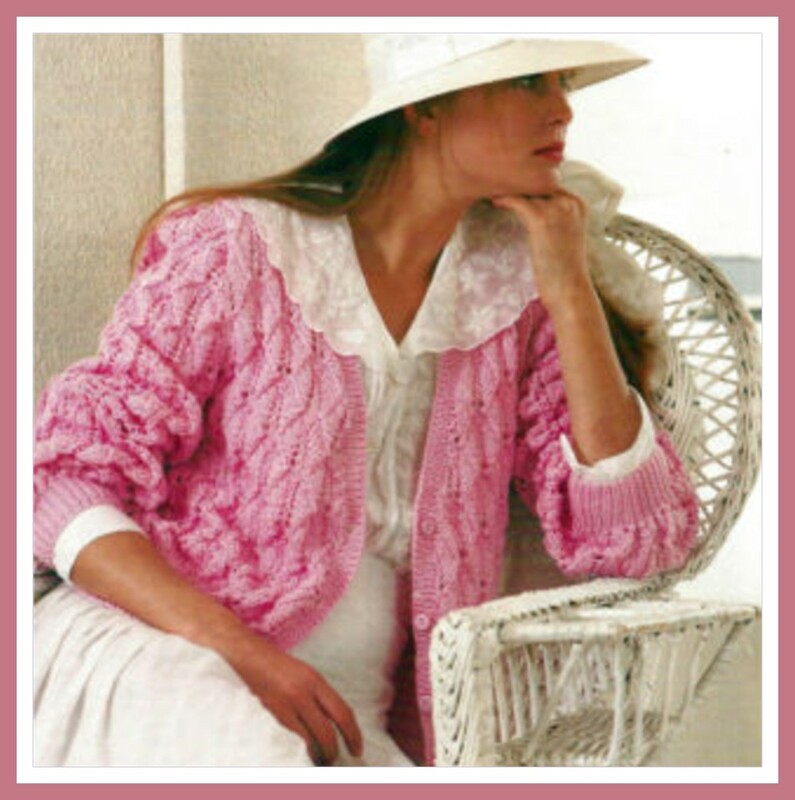 Although not the same, I believe that when combined with the pretty Pink Cardigan that I am currently knitting and a light-coloured linen skirt, will provide a very feminine outfit for the late Spring/early Summer season. 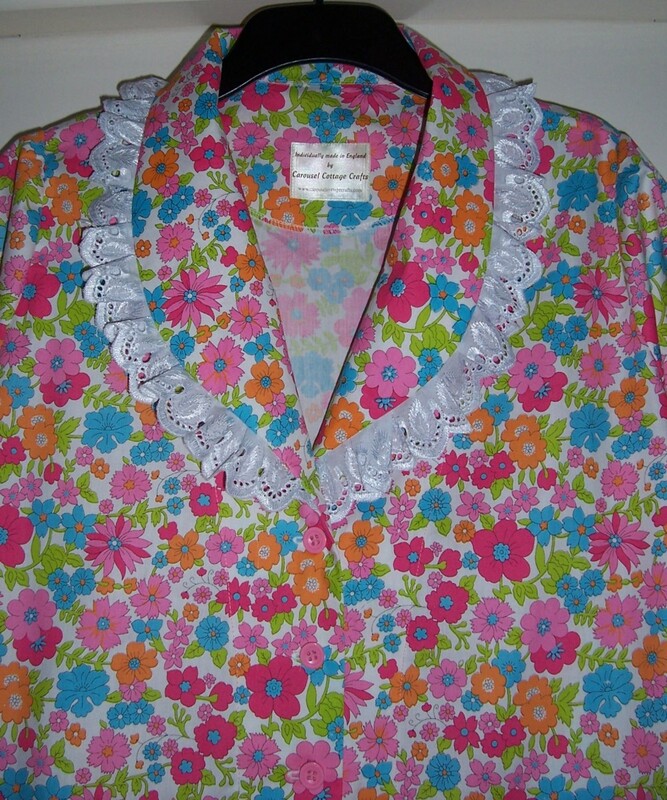 Having already made the Spring Floral print blouse, this version was very easy to put together with no fitting adjustments to be made. However, the Polyester Crepe fabric was not so easy to manage as it persisted in slipping and sliding all over the place! I altered the sleeves slightly from the original version by slashing and spreading the sleeve head to give more gathers at the shoulder. I used a very lightweight fusible interfacing for the collar/front facing and also the sleeve bands all of which are overlaid with the lace. I used the scallop edges of the lace yardage to make the frill around the collar. The very plain buttons are from my stash and once again I have given the blouse a shaped hemline which will provide plenty of length to tuck into a skirt. All seams are overlocked so that the inside is neat and tidy. I look forward to completing the knitting of the cardigan (over halfway there as we speak) and wearing the outfit on a sunny day! The Merchant & Mills Dress Shirt design kept popping up on various blogs and Pinterest boards and so I decided to try it. The pattern has been sitting in the pile for a little while. On opening the pattern envelope I was impressed with the quality of the pattern tissue and also the step by step instructions. 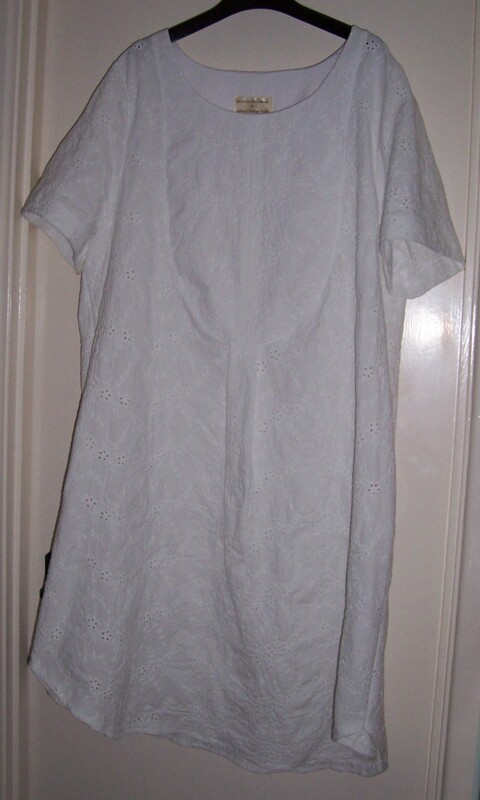 Before I cut into the lovely linen look fabric bought from Fabricland I decided to run up a test garment using a length of White crinkle Broderie Anglaise cotton fabric. This fabric has been sitting in the stash for at least five years so once it had been laundered it was time that it was stitched up! I graded the pattern from an 18 to a 22 and cut out the short sleeve version. 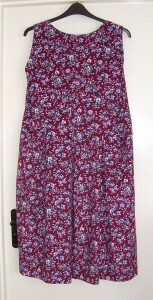 By following the instructions this dress was made up in a few hours and I am delighted with the result. 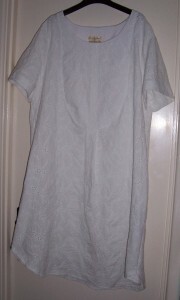 The length is just right and the Bib front will lend itself to a variety of different finishes, tucks, embroideries etc. The only negative that I found was a little bit of gaposis around the neckline but this I think is due to my square shoulders so next time I shall change the angle of the shoulder seam and I am sure it will be perfect. 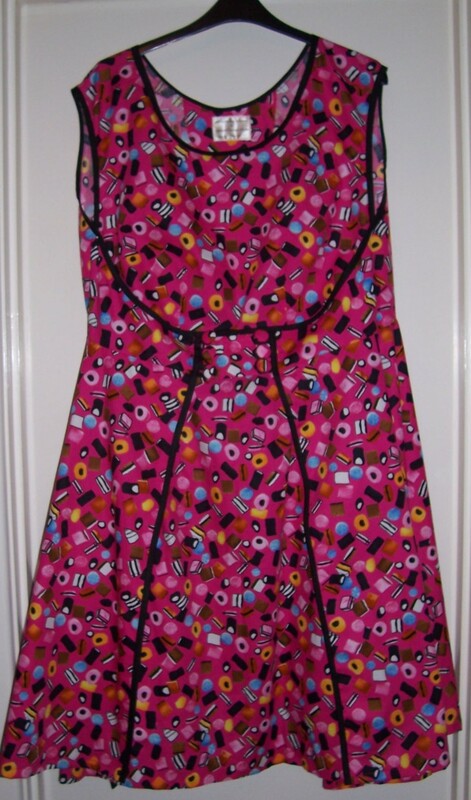 I look forward to a glorious Summer so that I can wear this dress! As soon as I have completed the crepe blouse with lace overlay collar and the Cerise Liquorise Allsorts Walkaway dress, I cannot wait to stitch another Merchant & Mills dress shirt in linen look cotton. Butterick pattern B4790 the “Walkaway” dress was used in week 3 of the Great British Sewing Bee as the technical challenge. It is proving to be as popular today as when it was first released in 1952 (the year after I was born!) The style was christened the “walkaway” dress because it was so easy “you could start it after breakfast …. and “walkaway” in it for luncheon! 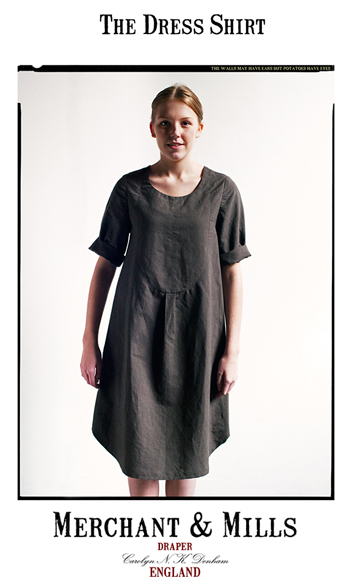 The simple flattering wrap design and easy construction are what makes the dress so enduringly popular. For once, I was ahead of the crowd as I purchased the pattern and sufficient fabric for the project back in the Spring of last year. However, with one thing and another, plus the fact that I mistakenly cut into the fabric for a.n.other project, it got put in the “roundtuit” pile. Having seen the design used on the GBSB and also last week on the Create & Crafts TV channel I was sufficiently galvanised to order new fabric and binding to make up the dress. I have chosen a Cerise background print of liquorice allsorts plus black bias binding from Fabricland. Having stated this fact at the most recent meeting of Sprat & Winkle Quilters the Ladies will now be watching the blog to see how quickly the finished dress appears. Know what my next project should be? 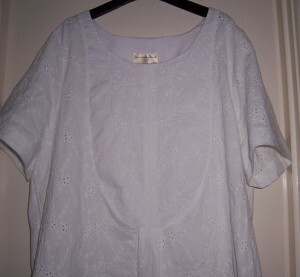 However, I have just this afternoon cut out the White polyester crepe for a blouse with lace overlay collar plus a White cotton Broderie Anglaise for the Merchant & Mills Dress shirt, the Walkaway dress is 3rd in the queue! 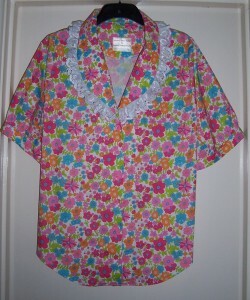 I have used up the final 2 yards of this fabric from my stash to make a pretty short sleeve blouse. 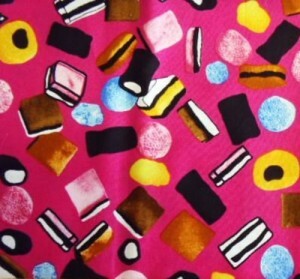 Fortunately I love the print as I now have three garments made from this cotton fabric originally purchased from Fabricland in Salisbury. 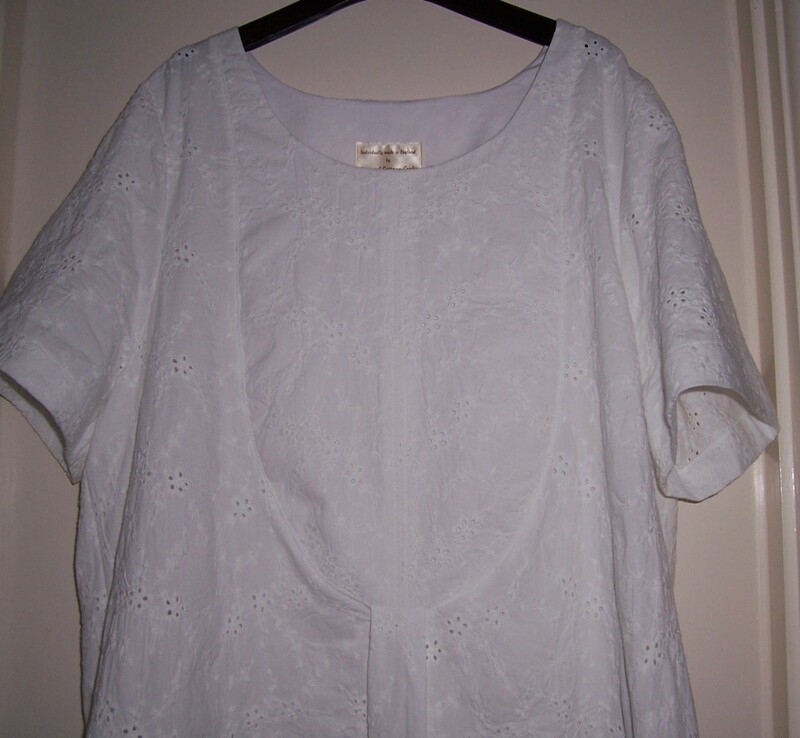 As I plan to make a White crepe de chine blouse with lace overlay collar I decided to “test run” this pattern which is a hack from a very old McCalls 6438 dress pattern. I changed the shaping of the collar and had previously drafted a different one-part sleeve. Although I have made up the pattern as a blouse in the past, with my variable weight and figure it is always a good idea to test run a pattern if it has not been sewn in the recent past. As the fabric is busy and I wanted some way to delineate the shawl collar I decided to add a frill of White Broderie Anglaise trim from my stash. The short sleeves are cut from the long-sleeve pattern that was in the poly bag and when I checked the width at the hem I realised that they were too wide. Not to be thwarted, I decided to gather the hem into a band and that easily solved the problem! 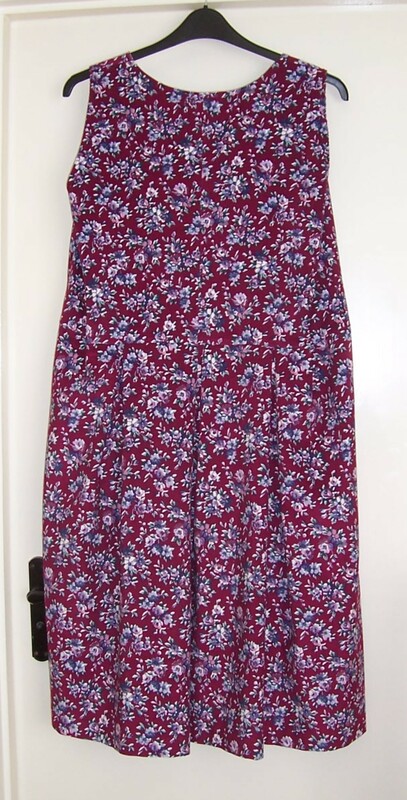 I shaped the hemline so that the blouse can be worn outside of jeans but also provides plenty of length should I decide to tuck into a skirt. All seams have been overlocked and the facings have been top-stitched to the bodice front to ensure they don’t flap about. 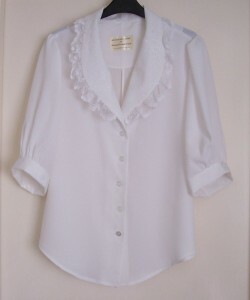 So all in all the inside of the blouse looks tidy and smart. 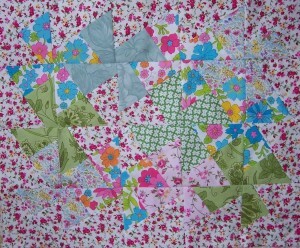 At our Franklins Salisbury, Monday morning Patchwork session this week we worked on the (in)famous Twister block. 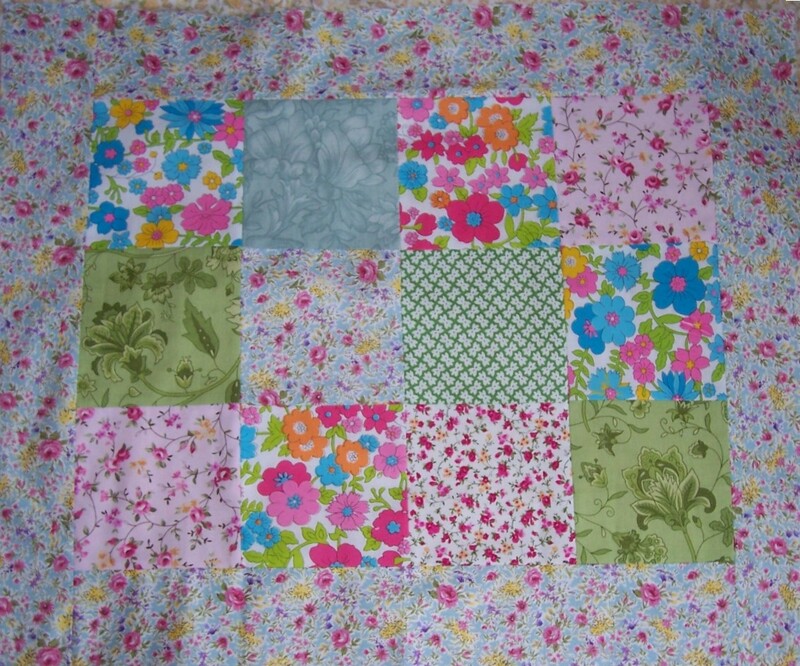 You start off with a panel of patchwork made up from 12 x 4.5″ squares surrounded by a 2.75″a border. Having used 1/4″ seam allowances you end up with a panel measuring approximately 21″ x 17″. Using the Twister template square you line up the cross hairs on the template with the seams on your panel and draw around the template. After cutting each new shape you then stitch them back together. 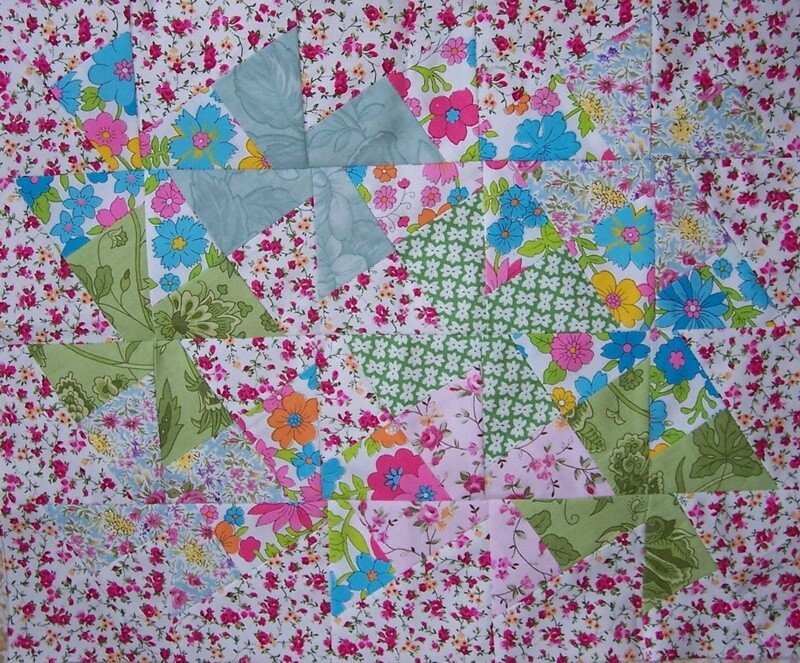 This will yield a panel of Pinwheels or Whirley Gigs and a new measurement 15″ x 12″. The panel can be made up into a variety of different projects, bags, cushions, place mats. I have made four panels so far to which I am adding a further border and will then be made up into two place mats with the remaining two as panels on a bag. 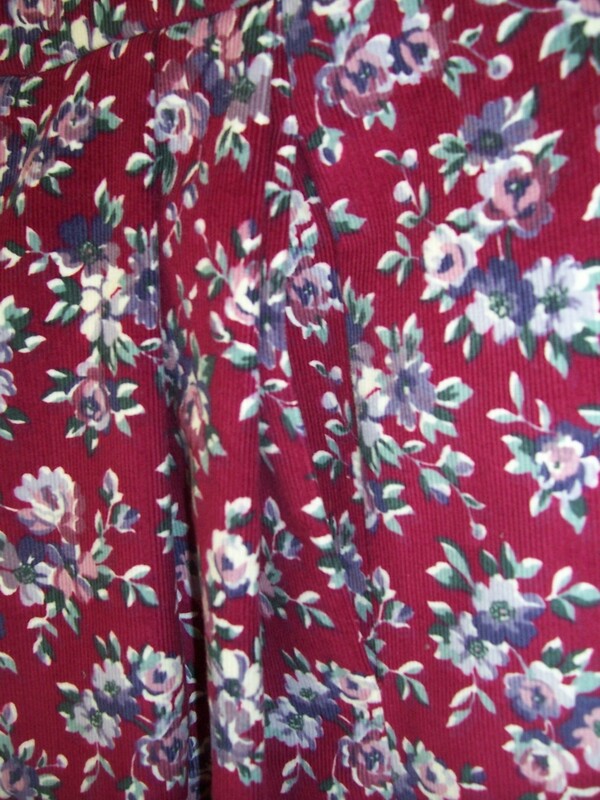 As the prints used are mostly spring-like florals they will be ideal for the coming (hopefully very soon) Spring! I purchased this pretty needlecord from a seller on eBay just a few weeks ago when I was actually looking for Sage Green! Oh well – I loved the colour and print so decided to go ahead with a pinafore dress whilst keeping an eye open for the Sage Green. 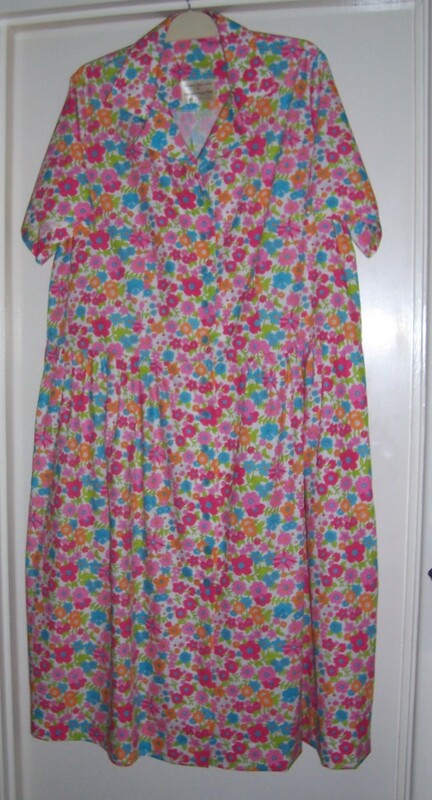 I hacked the bodice pattern from the Spring flowers shirtwaister dress by re-drawing the scoop neckline, reducing the slant and width of the shoulder seams. I decided to use an “all in one” facing for the neckline and armholes which means that I had to have a centre back seam and leave the stitching of the side seams until after the facings had been attached to the bodice. This is useful when hacking a pattern as it leaves opportunities for adjustment of width at the centre back and side seams. As the fabric was approximately 60″ wide I cut the skirt as 1 and half panels by the length required and decided the make the 1/2 width panel seams line up with the bodice darts. I also stitched the pockets into this panel seam which makes them very easy to get at. I used my usual pocket bag design so that the top of the bag is stitched into the waistline seam and prevents them flapping about inside the skirt. Having completed the bodice I double top stitched around the neckline and armholes before setting the pleats of the skirt. Due to the thickness of the fabric I wanted to keep bulk away from the side seams so the pleats are set in the centre third of the front and back. 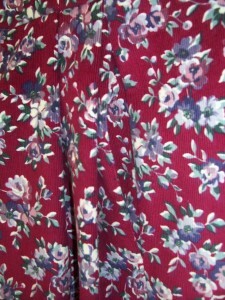 All seams have been overlocked and the hem was blind hem stitched on the machine. I am happy with the way that the pinafore dress turned out although next time I may reduce the amount of fabric in the back skirt. I have noticed that due to my “wonky” hip the pleats at the right back do not sit quite as flat as the left back but hopefully when the hip settles down this problem will resolve itself. 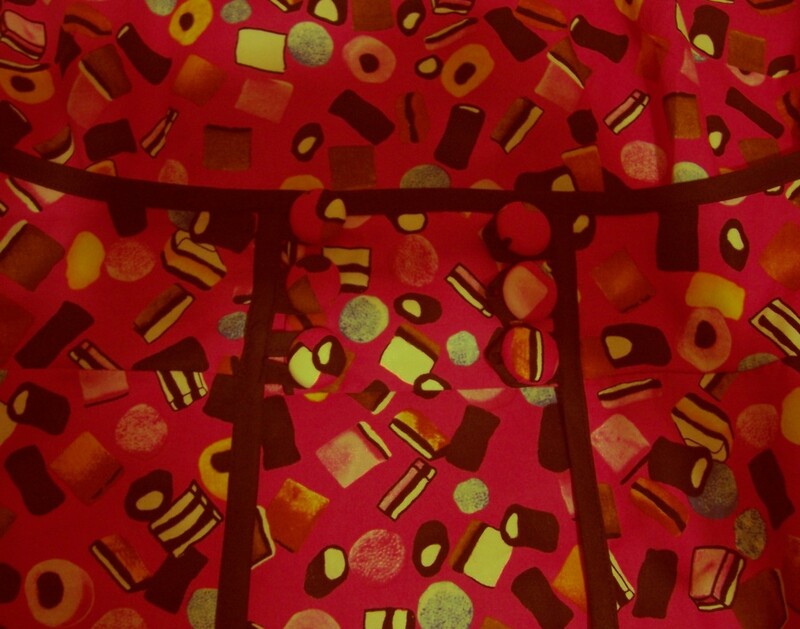 I cannot think what possessed me to purchase 8 yards of this colourful 100% cotton print from Fabricland, but it has come in very useful for test garments. Having completed the first of the Lisette tunics and as the sun was shining I decided to make a short-sleeved shirtwaister dress. 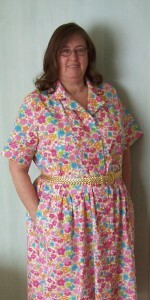 This design is mostly self-drafted with a hack of the collar from a vintage Style pattern 1441 from the 1980’s. 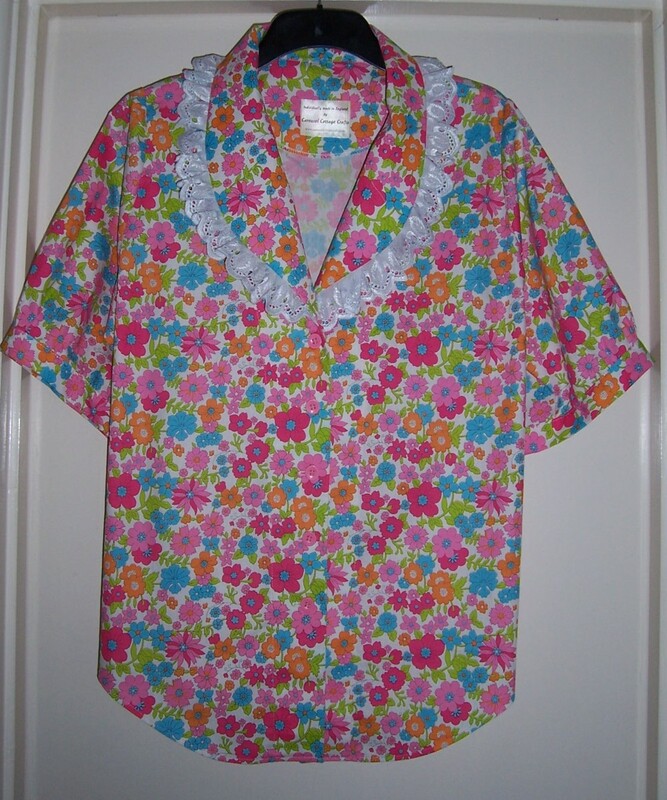 I have made up the blouse from this pattern many times and also hacked according to instructions in Threads magazine to do away with the yoke. I drafted the bodice with no darts having decided to model before placing the darts so that they fell in exactly the right place. The sleeves have a smooth cap and I think another time I will increase the sleeve head and add some small gathers. I cut the skirt as two full-width panels and made a centre back seam. I used my favourite in-seam pocket pattern so that the pockets are stitched into the waistline seam and don’t “flap” about inside the skirt. Having quartered the skirt panels I then lined them up with the side seams of the bodice and stitched together. It took quite a bit of “finessing” to get the waist seam to reflect my actual waistline correctly as I have a pronounced sway back. 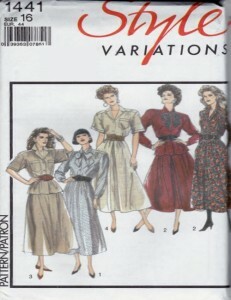 I needed 12 buttons for the button-thru look and should have checked my button stash first! I had only 10 buttons the same so had to add another 2 in the same colour but slightly different! But who will notice? They blend in so well with the floral pattern of the fabric and if anyone does comment I shall just say it is down to “quirkiness” of the dressmaker!